Many of those stranded are tourists. 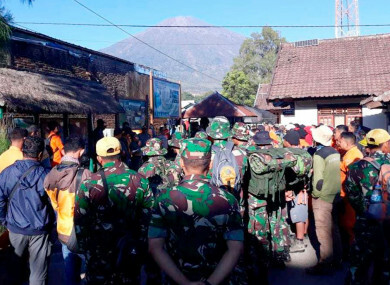 Indonesian soldiers and rescue team gather to prepare for evacuating tourists from Mount Rinjani today. INDONESIA HAS MOUNTED a rescue operation to reach more than 500 hikers and guides stranded by landslides on an active volcano on Lombok, a day after a powerful earthquake struck the holiday island. Tonnes of rock and mud were dislodged on the mountain in the 6.4-magnitude quake, which struck early yesterday and was followed by scores of aftershocks, leaving hikers with no easy way down to safety. “There are still 560 people trapped,” Sudiyono, the head of Rinjani national park, who goes by one name, said. The rescue operation on Mount Rinjani is likely to run until at least tomorrow and a military helicopter has dropped supplies at several spots on the mountain, according to search and rescue agency officials. Some 160 people were injured as a result, Mohammad Rum, head of West Nusa Tenggara disaster agency, said. President Joko Widodo visited the affected site today and promised financial support for people who had lost their homes. Email “Over 500 hikers stranded on mountain after landslides in Indonesia”. Feedback on “Over 500 hikers stranded on mountain after landslides in Indonesia”.